Oh what a fun color challenge we have for you over on Create with Connie and Mary – Blushing Bride, Rose Red, and Blackberry Bliss. The colors were inspired by the Artisan Embellishment Kit so I decided use it as the inspiration for my card this time. This is not really a ‘style’ that I am comfortable with this more ‘frilly’ style but I do like the fun inspiration from the kit and think they really work nicely on my card. Add lasercut rose panel to panel, wrap piece of Blackberry Bliss Velvet ribbon around panel and add to card front using dimensionals. Cut medium butterfly out of Blackberry Bliss and add to card front. 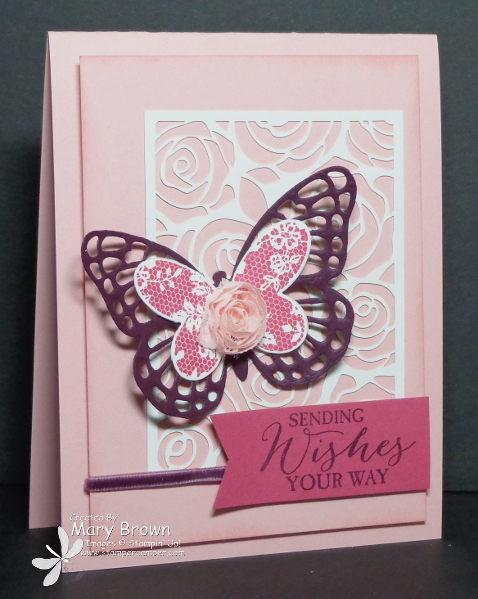 Stamp butterfly using Rose Red on Whisper White, cut out using butterfly framelit. Add Blushing Bride rose from Artisan Kit to the center of the butterfly. Stamp greeting using Blackberry Bliss on Rose Red 2 1/2 x 1, cut into banner and add using dimensionals. This entry was posted in Create with Connie and Mary, Spring Mini and tagged Butterfly Basics. Bookmark the permalink. Mary, I think you rocked this “frilly” style. And it still has your flair to it as well. Beautiful card! Mary, I love it and I’m CASEing it for my ladies next week. I promised them I would do the butterfly this month. Thanks so much and the colors are perfect. Mary, I love it and love it so much I’m CASEing it for my ladies next week. The colors are perfect and I promised them I was going to use the butterfly. I will have to spritz the rose lazer cut panel because I have only four and my group is twelve. But that’s one more skill for them to acquire. Thanks for a beautiful card. Your card is gorgeous!! Wonderful use of the kit. I am so glad I bought two of them LOL, frilly isn’t my thing either but these products can’t be resisted! Gorgeous card! I love the die cut background and the layer butterflies! This “frilly” card is still very clean! I love it! Beautiful card, Mary! I love feminine-frill!! So beautiful!!! I absolutely love the layered butterfly with two colors plus the rose, such a great idea!